ALLOWS CONNECTION OF AN ATARI COMPUTER TO A MODERN / TV STANDARD COMPOSITE VIDEO JACK (YELLOW RCA JACK). INCLUDES DUAL MONO AUDIO CHANNELS. COMPATIBLE WITH 800 800XL 1200XL 65XE AND 130XE. (SUPPORTS NTSC AND PAL). 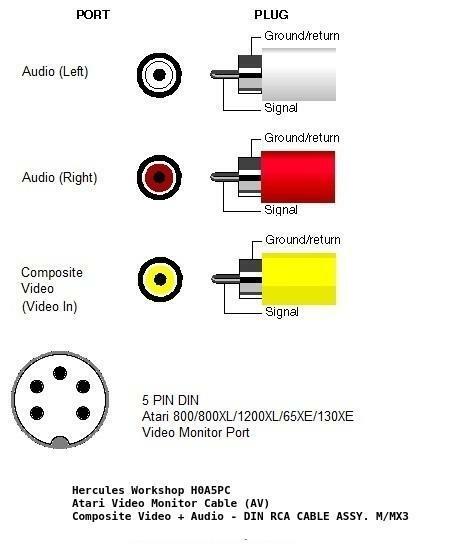 This is the most basic common A/V cable for the Atari 8-bit computers, it will work with all Atari computers with a Monitor port and almost all modern TV's. It's used to connect the Monitor port of your Atari to the Video inputs of your TV (the RCA jacks on your TV). VERY HIGH EMI AND RFI NOISE REJECTION. Any video display monitor that supports composite video input (this includes almost all modern televisions) should be able to display the Atari's composite video signal (on your TV it's the RCA jack, usually yellow and labeled video in). See photos for connection example.